It is understandable that most tourists prefer to arrive on Boracay with a hotel voucher in their pocket, so that once on the island they no longer have to search for a place to stay. Unfortunately, the prices of the hotels on the various booking sites such as Agoda, hotel.com and what ever they are called, are far beyond what you can book on Boracay Island by yourself. This might scare many vacationers who might prefer a cheaper accommodation on Boracay as what they can find on this booking web sites. Additionally, if you book in advance, you might sometimes have to double-pay the hotel room, if you travel with two people. If you take the time and look for a hotel by yourself, you only have to pay for the room once, no matter if you stay alone or with two people. If you need a third bed in the room, they will ask an additional charge of about 300 Peso per night. 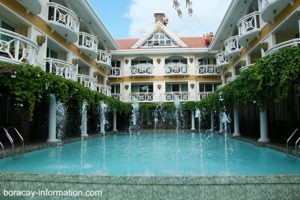 Hotels like this one on White Beach on Boracay may ask prices from 2000 Peso per night onwards. It is indeed very easy to find a room on Boracay by yourself at any given time or season of the year. Only on Christmas, New Year and during the Eastern holidays it might get a little crowded on Boracay, when all the Filipinos are on holiday, too. Now, how much are the hotels on Boracay? Basically you can say that the hotels located right on the beach front and in the center of the famous White Beach, ask prices from 2000 to 2500 Peso upwards. Towards the top, there are virtually no limits but well, it does not always need to be the presidential suite, does it? Alice in Wonderland Resort, only 200 meter from White Beach is available from 1400 Peso per night. More cheaper hotels, resorts and guest houses can be found in the small side streets that lead from White Beach in the direction of the main street. 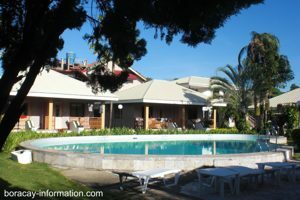 Here you will find prices from 1500 to 1800 Peso per night, even during the high season. This rooms are clean, with air con, mini bar and Cable TV. It should be noted that only a few hotels on Boracay have a swimming pool and if so, it might only be a relatively small one. However, they don't really need one, because of the "large pool" is indeed only a few steps away. Cheaper hotels than the ones described above, one can find at the outskirts of White Beach and on other beaches of the island. Especially on Bulabog Beach opposite White Beach on the other side of the island, prices are still very affordable and may range even below 1000 Peso.